An Iranian delegation comprising representatives from 180 companies visited Syria to assess business opportunities in the war-torn country, Iranian and Arab media reported. Mohammed Saif al-Din, aide to Syria’s Minister of Public Works and Housing, said the Iranian delegation mainly represented the fields of construction, energy and mining. The representatives reportedly surveyed various locations to set up factories and plants for the production of construction materials to help Syria’s rebuilding process. 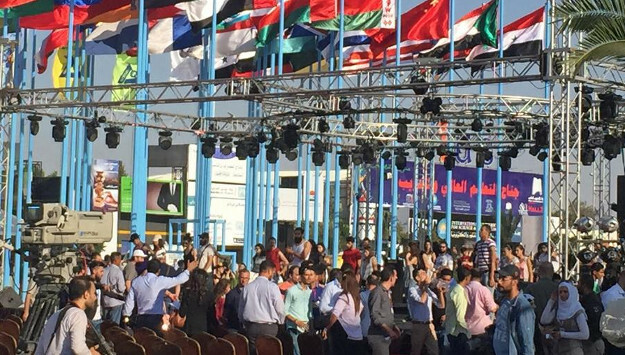 The Iranian delegation had meetings with Syrian Public Works and Housing Minister Hussein Amous and other senior officials in the ministry following their participation in the Damascus International Fair, which began on September 5 and lasted for 10 days. In an interview with al-Watan newspaper, Saif al-Din said the Ministry has agreed to cooperate with the Iranian delegation in their efforts to invest in Syria. He added that the ministry will assist Iranian and Syrian companies to implement joint infrastructural development ventures, such as dams and power plants. The two sides agreed on forming a liaison group to make the necessary arrangements for future meetings to set the framework for bilateral initiative. Comment: Iranian and Russian companies had the largest representations in Syria’s trade fair. With the tide of war gradually receding, Damascus hopes that its two closest allies will now play a major role in the country’s rebuilding efforts. But to Syrian President Bashar al-Assad’s dismay, both Iran and Russia are facing growing economic challenges exacerbated by latest U.S. sanctions on both countries. Security problems in Syria and international sanctions on the Assad regime also discourage other countries from participating in the war-ravaged country’s reconstruction. Western countries are also reluctant to take part in Syria’s rebuilding as long as the Assad regime is in power and there is no political settlement in the country. Moreover, while Iran and Russia cooperate to assist the embattled Assad regime, Tehran and Damascus are more rivals than allies when it comes to their roles in Syria’s economy. Iran has recently stepped up efforts to play a major role in Syria’s economic recovery and become the Arab country’s leading trade partner. In December, the chief commander of Iran’s Islamic Revolution Guards corps (IRGC) revealed that the Guards, rather than the Iranian private sector or other state-run companies, will spearhead Syria’s reconstruction efforts, Tasnim News Agency reported. “Based on meetings held in the government, it was decided that this mission [participation in Syria’s rebuilding] should be assigned to Sepah [IRGC] because of the security situation in Syria,” Major General Mohammad Ali Jafari said at a gathering in Tehran. “Of course it is up to the Syrian government to decide to what extent Iran should participate in in the reconstruction [of Syria]. But the initial work for this mission is underway,” the IRGC commander added. As Jafari indicated, the IRGC will be the sole beneficiary. Last September, the Iranian government signed several agreements with Damascus to restore Syria’s power grid and infrastructure. Iran and Venezuela are also set to start constructing an oil refinery in Syria by this year’s end, according to a senior official of Iran’s Research Center of Petroleum Industry (RIPI). The IRGC, which is heavily involved in Iran’s economy and carries out projects outside Iran, has propped up the embattled Assad regime in the past seven years and is now seeking financial rewards for its role. Since the seizure of the northern Syrian city of Aleppo in December, the Syrian government has granted IRGC companies lucrative contracts on a no-bidding basis. When Syrian Prime Minister Imad Khamis visited Tehran last year, for example, the Iranian government signed several agreements with the Syrian delegation. One major contract to build a mobile phone network in Syria was awarded to the IRGC-affiliated Mobile Telecommunication Company of Iran – delivering Iran’s elite military force an additional source of revenue. As in Lebanon, the IRGC is complementing its hard power mission with economic projects and other soft power strategies to consolidate its long-term presence and influence in Syria.